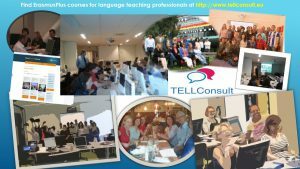 In collaboration with its international partners and national experienced tutor/teachers TELLConsult Training coordinates professional development workshops, courses and school coaching trajectories related to educational innovation by integrating the use of information and communication technology based on academic research. The experts in our international network can also deliver consultancy, training and coaching trajectories on demand, e.g. to support KA2 School Exchange Partnerships. So please contact us in case you need customised contents and/or specific workshops.